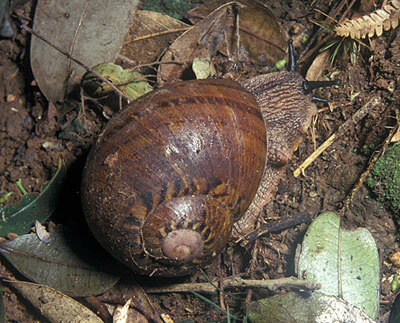 Australia’s largest land snail is the Giant Panda Snail (Hedleyella falconeri) – the shell of which may reach 90mm in height. This species is often encountered in the rainforests around Brisbane, particularly at night after rain when they are out feeding on fungi. The shell is generally dark brown with darker broken spiral markings and the animal has stripes and black tentacles. The snails live under logs, forest debris or in leaf litter near the bases of fig trees. Giant Panda Snails occur as far south as Barrington Tops in NSW and are preyed on by animals such as scrub turkeys, feral pigs and Pitta birds.